An engineering career in the forest products industry offers as many rewards as it does opportunities to solve challenges. That’s what candidates in the Engineering Graduate program are discovering on the job at Resolute. Before starting at Resolute, Simon Fortin already knew a lot about the company – especially when it came to safety protocols. As a project manager for a software firm, Simon spent many hours in various industrial settings implementing a health and safety software. And one of his favorite clients was Resolute, especially when it came to working with the teams at Iroquois Falls, Ontario, and at Saint-Félicien, Quebec. 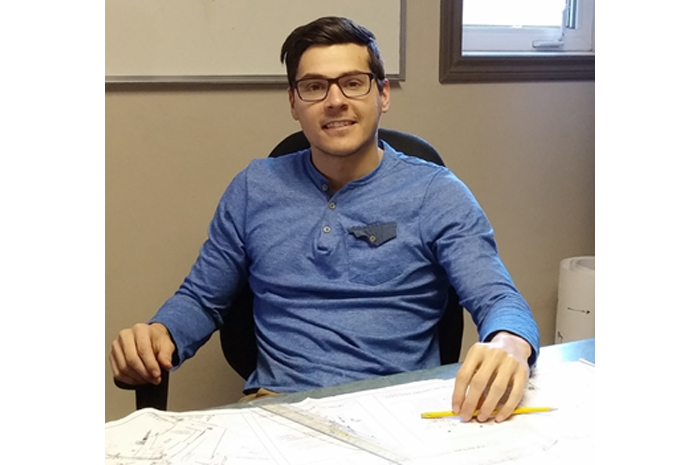 But rather than starting in pulp and paper, Simon’s industrial engineering background landed him in our La Doré sawmill, first as a continuous improvement manager, then as part of the Engineering Graduate program and eventually into a permanent position as the facility’s project engineer. We caught up with him at the end of a busy day to talk about the work he does, how he got there and his thoughts on the industry. What made you want to work for Resolute? I worked at the Iroquois Falls paper mill and later at the Saint-Félicien pulp mill as a contractor. I was implementing a software system to help with lockouts and tagouts (safety-related procedures used to block energy from getting to certain machines during maintenance and other activities to protect workers) so I worked with a lot of different departments. The people were great and seeing the work culture there made me want to work for Resolute. What was it about the work culture? I saw a dynamic team with a genuine focus and attention to health and safety. And they worked efficiently. You could see that their projects could always go forward at a good pace. It was somewhere I could see getting things done without getting stuck in a bureaucracy. So your work in the mills helped to get you into Resolute? Not directly. I did all that work in the pulp and paper mills but a friend passed my CV on to a director at Resolute’s Mistassini (Quebec) sawmill and I was eventually hired as a continuous improvement manager at the company’s La Doré sawmill. I joined the Engineering Graduate Program when the opportunity came up and, as I was doing that program, I was asked if I wanted to be a project engineer for the site. I’m basically accountable for managing projects related to the operation. It can be anything from process improvement projects to infrastructure and expansion to overseeing modifications to the line. I help to identify the goals, figure out the solutions and cost it out, get the approvals and then work with suppliers to get it done. There are always challenges to solve and we’re given a lot of autonomy to do it. So I don’t have to ask a supervisor about every little detail and I can just focus on getting the work done. Also, there’s a lot of action in a day. I could have an installation going on outside, an optimization project going on inside and the construction of a building somewhere else. It’s really diverse. You’ve lived in the Lac-Saint-Jean region so you’re familiar with the forest products industry. What is something that surprised you once you started working in it? I think it was the very high level of material recuperation. How every aspect of a log is used, the offcuts, the bark, even the sawdust. I was expecting to see a bit of wastage, but it doesn’t happen. What perceptions about forestry would you like to see change? There was a time when people thought of forestry as deforestation, but I think that’s in the past. Nowadays, the only deforestation that happens is when a tree is cut down to make way for a highway, agriculture or urban development. There’s a perception that forest products companies just do what they want in the woods but that’s not true. I do a lot of field work and I see firsthand how we treat the forest like a garden. You have to cultivate it. What’s your impression of the industry’s work on sustainability? I was frankly surprised at how broad the approach to sustainability actually is. We are working to improve our environmental impact in all sorts of ways, from water consumption rates to how much oil we use to how much waste we divert from landfill. And everything is tracked and graphed so we’re always challenging our own numbers to find ways to improve. What advice do you have for someone who is thinking about a career in the forest products industry? This is an industry that has adapted very well to its share of challenges. And part of that is by listening to its people. If you have good ideas they not only get consideration, they get implemented. Also, I just love the process. I worked in mining, and that was dirty and dusty and you don’t see the whole process. A sawmill is easy to understand because you know what the primary input is and you know the output. It’s a beautiful process, and it smells great! What leader, living or dead, do you most admire? Nelson Mandela because he’s a unifier and because he kept his convictions through terrible adversity. What skill do you consider overrated? For leaders, I think it’s public speaking. Often they are judged by their ability to connect with an audience but I think vision, commitment and social skills are more important. Running shoes. I always seem to have a good reason to buy new ones. I enjoy endurance sports like running, road biking and mountain biking.